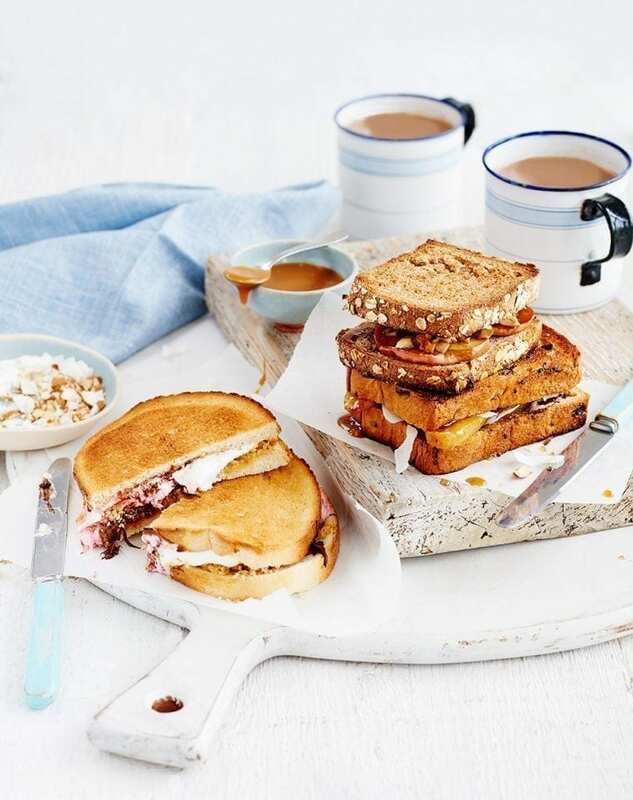 Try adding something sweet to your toastie maker with these recipes including a Tunnocks tea cake idea, tropical banana creation and an indulgent butterscotch and caramelised apple toastie. Brush 2 tbsp of the melted butter on one side of each slice of bread. Place two pieces (side by side) butter side down in your toasty maker. (Or if using the grill – lightly toast the buttered side of 2 of the slices). Stir the biscuits into the remaining melted butter and divide between the two slices of bread in the toasty maker (or flip over the grilled slices and spread over the plain side). Divide the marshmallows over the top – clustering them in the centre to stop too much escaping when cooking then scatter over the chocolate. Top each with a slice of bread – butter side facing out then toast or grill for 3-5 minutes until gooey, oozy and delicious. Gently melt the sugar in a medium frying pan with a splash of water, turn up the heat, then add the apple slices. Toss so they are well coated in the melted sugar and allow to bubble and caramelise for 3 minutes. Meanwhile, brush the melted butter on one side of each slice of bread. Place two pieces buttered side down in your toasty maker (or if using the grill – lightly toast the buttered side of 2 of the slices). Spread a thick layer of salted caramel sauce over each slice in the toastie maker (or flip over the grilled slices and spread over the plain side). Then layer over the caramelized apples including any remaining sauce, sprinkle over the almonds. Top with the remaining bread (buttered side up) and toast or grill for 3-5 minutes until golden on the outside. Slice and serve with clotted cream. Heat the knob of butter and sugar together in a medium frying pan over a medium heat, stirring until the sugar has melted. Slice the bananas and add to the pan with 1tbsp rum. Allow to spit and sizzle then leave the bananas to caramelise on one side for 2 minutes, then carefully flip them over to do the same on the other for a further 2 minutes. Meanwhile brush the remaining butter over one side of each slice of bread and place two slices into the toasty maker, butter side down (or if using the grill – lightly toast the buttered side of 2 of the slices). Brush 1tbsp rum over the bread (or flip over the grilled slices and brush over the plain side). Divide the bananas between the two rum soaked slices brioche. Scatter over the coconut flakes and crumble over the dark chocolate. Brush the remaining slices of brioche non-buttered side with rum, then pop on the top. Toast or grill for 5 minutes until golden.